Article 9 of the SPA/BD Protocol provides that the proposal for inclusion in the List is submitted: (i) by the Party concerned, if the area is situated in a zone already delimited, over which it exercises sovereignty or jurisdiction; (ii) by two or more neighbouring Parties concerned if the area is situated, partly or wholly, on the high sea; and (iii) by the neighbouring Parties concerned in areas where the limits of national sovereignty or jurisdiction have not yet been defined. The Parties concerned provide RAC/SPA with a presentation report, whose format was adopted in 2001 by the Contracting Parties to the Barcelona Convention, containing information on the area’s geographical location, its physical and ecological characteristics, its legal status, its management plans and the means for their implementation, as well as a statement justifying its Mediterranean importance. After officially sending the presentation report to RAC/SPA, the proposal is submitted to the National Focal Points which shall examine its conformity with the guidelines for the establishment and management of specially protected areas and the common criteria for the choice of protected marine and coastal areas that could be included in the SPAMI List (Annex I of the SPA/BD Protocol). If the proposal is considered to be consistent by the National Focal Points, RAC/SPA then transmits it to the Secretariat, which informs the meeting of the Parties, which decides to include the area in the SPAMI List. For an area situated, partly or wholly, on the high sea or in areas where the limits of national sovereignty or jurisdiction have not yet been defined, the decision to include the area in the SPAMI List is taken by consensus by the Contracting Parties, which also approve the management measures applicable to the area. 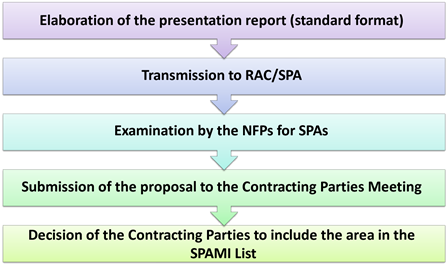 Lastly, the Parties may revise the SPAMI List according to the "Procedure for the revision of the areas included in the SPAMI list" adopted in 2008. The objective of this procedure is to evaluate SPAMI sites in order to examine whether they meet the criteria of the SPA/BD Protocol’s Annex I. For this aim, a format has been prepared and is available at this link.